This illustrated history has about 60 photos of these County Armagh settlements, the biggest of which is Lurgan which had its origins in the 1610 Plantation of Ulster. 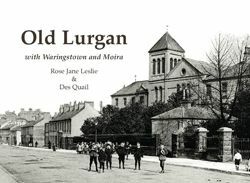 From small beginnings Lurgan grew substantially with the development of the linen industry in the 19th century and the townscapes in the book reflect the architecture of the Georgian and Victorian period. Through informative captions Rose Jane Leslie tells the story of Lurgan and that of Magheralin, Moira, Dollingstown, Maghera and Waringstown and the selection of photographs is a mix of social history and street scenes.